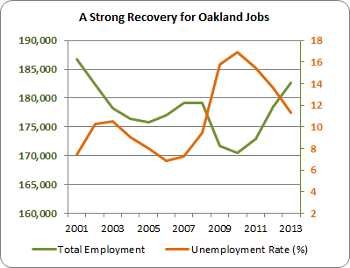 Oakland is home to a thriving, diverse, sustainable economy with attractive business and employment opportunities. The City works to enhance the local business climate to attract, grow, and retain Oakland businesses, and to create jobs that enable our residents to pursue their career aspirations. Local workforce development networks are helping to build skills and expertise among residents and businesses for success in the evolving global economy. Oakland offers support for local businesses "go green" in their operations, improve energy efficiency, and boost their bottom lines. 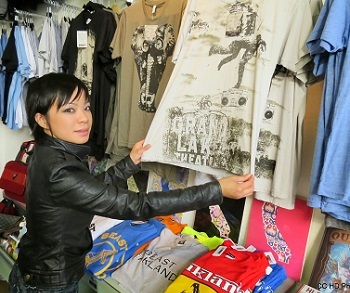 Kiva Zip Lending Helps New Businesses Flourish - In December 2013, Oakland became the first US city to be a Kiva Zip Trustee. Kiva Zip is a microloan program that helps small startups develop and establish themselves within the local business community. Operated through the Oakland Business Assistance Center at City Hall, the program provided three loans in its first round of funding in 2013, and another 10 were made available in September 2014. Small business activity and early financing for small‐scale entrepreneurs are particularly critical in Oakland, where 90 percent of enterprises have 20 or fewer employees. Green and Cleantech Sectors Expand - Formed in 2013 and originally co‐housed with Oakland’s solar powerhouse Sungevity, SfunCube (“solar for universal need”) is home to more than a dozen startups working to make solar energy more accessible. As Sungevity grew to 400 employees in Jack London Square, SfunCube was “pushed out of the nest” in June 2014, landing on the top three floors of the downtown Wakefield Building. The move shortens the commute for original SfunCube resident, solar financing pioneer Mosaic (now close to 30 employees), and other members. Another addition to the cleantech sector and Oakland’s “Negawatt Alley” is Vigilent, which optimizes cooling efficiency for data centers and server farms. Vigilent arrived in late 2013 with 55 employees and has since grown to more than 70. 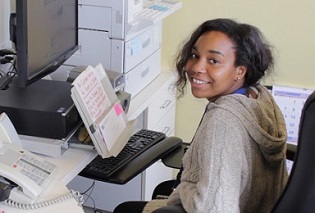 Mayor’s Summer Jobs Program (MSJP) Helps Youth Rise Up - The MSJP enhances workforce development while providing positive summer experiences for youth. The program hosted 1,594 participants ages 16 to 21 in 2013, and more than 2,100 in 2014. Participants earn up to $1,000 while gaining on‐the‐job training and experience in office support, childcare, retail, auto mechanics, construction, mural painting, and more. In 2014, the Oakland Housing Authority contributed $450,000 to create 300 jobs through the program. Other contributors include Bank of America, JP Morgan, the Clorox Foundation, the Port of Oakland, BART, and the Kaiser Permanente Foundation. Oakland Food & Beverage Story Grows - Oakland food and beverage businesses increased by 30% in the last two years. This includes 30 “cottage food operations” – food produced in home kitchens for public sale – that have opened since California enacted the 2013 Homemade Food Act (HFA). The HFA was written with the help of Oakland's Sustainable Economies Law Center. Across the City, sales of locally‐produced edibles are flourishing, including beer and kombucha, kim chee and pickles, baked goods, and fully‐prepared “subscription” meals. The City works with the Hope Collaborative and the Oakland Food Policy Council to increase the availability of healthy, fresh foods in low‐income neighborhoods – work that helped lead to a new full‐service grocery store opening in East Oakland in March 2014. Vator Splash Marks Oakland Tech Wave, Triples Attendance - With more than 300 businesses and an estimated $242 million in venture capital invested in the last fifteen months, Oakland’s tech community is growing. In May 2014, international tech conference Vator Splash convened nearly 1,000 investors and entrepreneurs in Jack London Square for a start‐up competition. Traditionally held in Silicon Valley or San Francisco, organizers moved the flagship event in response to Oakland’s emerging technology cluster, tripling the event’s turnout. Many Oakland start‐ups participated in the competition, including OppSites, a real estate listing app, which won the grand prize. Community Benefit Districts Expanding - In 2013, Oakland welcomed the Jack London Improvement District (JLID) as our 10th Community Benefit District (CBD). A key to neighborhood revitalization, CBDs provide safety, business attraction, development services, and other benefits to local businesses in diverse areas of the City. CBD managers attend monthly forums, convened by the Oakland Chamber of Commerce, to collaborate and exchange information. JLID and three other downtown and uptown CBDs now create continuous representation from 23rd Avenue to the Bay. Oakland NGOs Host National Economic Localization Conference - The seminal “shop local” organization, Business Alliance for Living Local Economies (BALLE), convened more than 600 local business enthusiasts in Oakland in June 2014. Hosted by Oakland Grown and the Oakland-based Sustainable Business Alliance, conference attendees celebrated and sought to enhance the benefits of keeping commerce local. The event included tours and other direct participation by Oakland based companies. Oakland Grown is known for sponsorship of the Oakland Grown card, whose users accrue discounts and trading opportunities as they shop with participating merchants. Co-Working Booms in Oakland, Re-Inventing Work Culture - First came Tech Liminal at City Center. Oakstop added artists to the mix in Uptown, and Kitchener Oakland brought commercial kitchen access for food startups. LOL (Liberating Ourselves Locally) Hackerspace brought Maker space to East Oakland. Co-working spaces have continued to expand and evolve throughout Oakland, and the end of 2014 brought several innovative developments. Upper Broadway’s Impact Hub is adding the Youth Hub to connect young innovators with Oakland businesses. The Port Workspaces added to their two Jack London Square locations with new facilities at the Kaiser Center and Pacific Law building, including a second commercial kitchen. In Temescal, Omni Commons provides shared resources to a community of collectives and supports decentralized, open governance. Look for the newest project, a co-living and co-working space that blurs the lines between social and professi onal communities called the Canopy, to open east of Lake Merritt in February 2015. 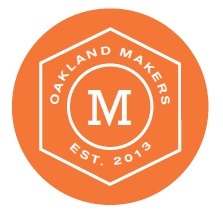 Oakland Makers Create a Buzz - Co‐Founded by the City’s Economic Development division and Oakland’s industrial arts and custom fabrication community, Oakland Makers is a nonprofit working group of makers, educators, and economic developers working to sustain and build the City’s diverse creative economy. Highlights of 2013-14 include leadership in the National Maker Mayor’s Challenge and several new maker‐spaces, such as hardware accelerator Blue Sprout. The second annual Mini‐Maker Fair will be held at Studio One Art Center in October 2014. Local Business Growth Boosts Jobs - Oakland’s employment rate is climbing as businesses continue popping up or relocating here. The number of Oakland business licenses increased 8% from 2013 to 2014. Total employment was 182,700 in 2013, and climbed to 185,200 by June 2014. The unemployment rate was 11.3% in 2013, and continued falling to 9% by June 2014. The City’s population also grew by 15,000 in the last three years. The qualities that attract businesses and residents to our city are known: flourishing arts, cultural diversity, distinct neighborhoods, a vibrant downtown, and a passionate citizenry. These combine with the strong business case of diverse building stock, affordable commercial rents, a talented workforce, and location at the center of the BART universe. Oakland Leads Nation in Recovering from the Housing Crisis - The California Association of Realtors ranked Oakland the No. 1 city leading the nation’s housing recovery. The median list price in Oakland was up 41.3% from the previous year, and days‐on‐the‐market decreased 53.1% from the previous year. Oakland No. 5 Among The Top 10 US Cities For Tech Entrepreneurs - Online newspaper Wealth Management ranked Oakland number five among the top ten US cities for total venture capital investment in the first quarter of 2014. Visit the City's Economic Development home page. Learn about the City's green economic development programs.